It's for another processor launch from Intel. The new Ivy Bridge is a 22nm architecture based on the same LGA1155 socket as Sandy Bridge. It's basically a shrunken die from Sandy Bridge (32nm) supporting many of the same features, but on the supporting Z77 chipset side (code named "Panther Point"), adds native USB 3.0, PCI Express 3.0, Lucid MVP and faster DDR3 memory support. This chipset is found on motherboards like the MSI Z77A-GD65 that we reviewed with the original Sandy Bridge CPU onboard. We think the new Intel Z77 chipset is a worthwhile upgrade for P67 board owners who use their system for more than gaming. Like anyone else, we want to know what kind of performance gains Ivy Bridge offers over Sandy Bridge. Is Ivy Bridge fast enough to make us want to upgrade the board and CPU? Or can we stick with Sandy bridge and just upgrade to a Z77 platform? It's time to find out! The physical differences are underneath those little aluminum CPU caps. While Ivy Bridge and Sandy Bridge offer similar features, the former is designed to speed up performance as well as add a few new features. Because the list is always changing from processor to processor, let's break them down quickly before eating more technical jargon. Even though Ivy Bridge flaunts 1.4 billion transistors, you wouldn't notice by looking at her 22nm figure. The die shrink means lower power consumption and thermal output. Ivy Bridge's turbo performance is higher due to the chips more efficient thermal monitoring. She knows when to work harder to help accomplish a task without costing you valuable power. However, overclocking the cores to get to that 2667MHz DDR3 divider will naturally get hot and consume more power. Regular Ivy Bridge SKUs (on the left) consume a max of 77 watts while Sandy Bridge's is 95 watts at full load. This includes turbo load operations. Thanks to the 22nm architecture, this achievement is very impressive. 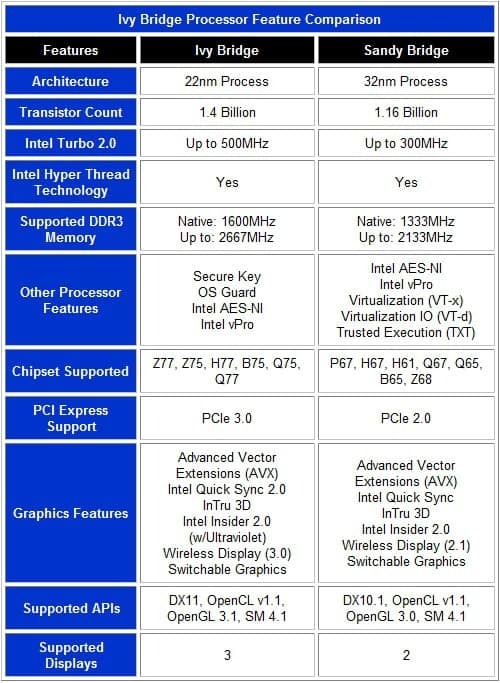 In fact, Ivy Bridge's max turbo frequency is 400 MHz vs Sandy Bridge's 300MHz. That's not a whole lot of extra clock speed gain, but the new architecture's enhancements like L2 cache and enhanced memory controller efficiency give it a punch which we'll see later on. 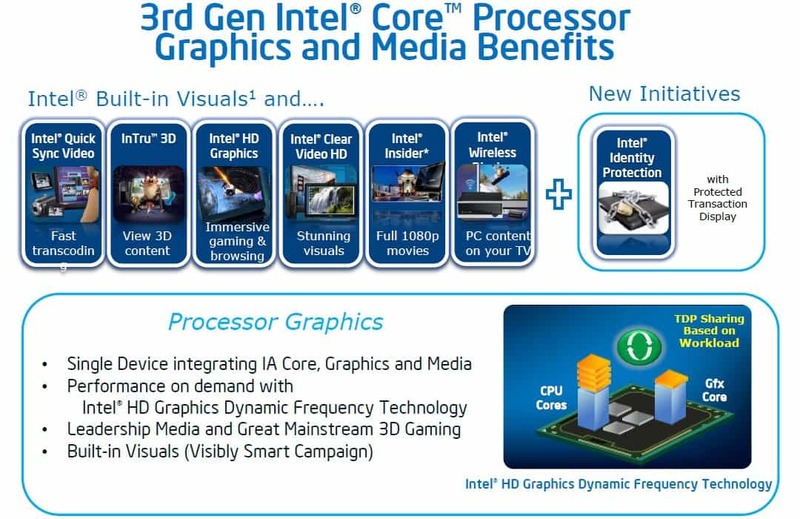 Ivy Bridge sports a new Intel HD 4000 integrated graphics processor. 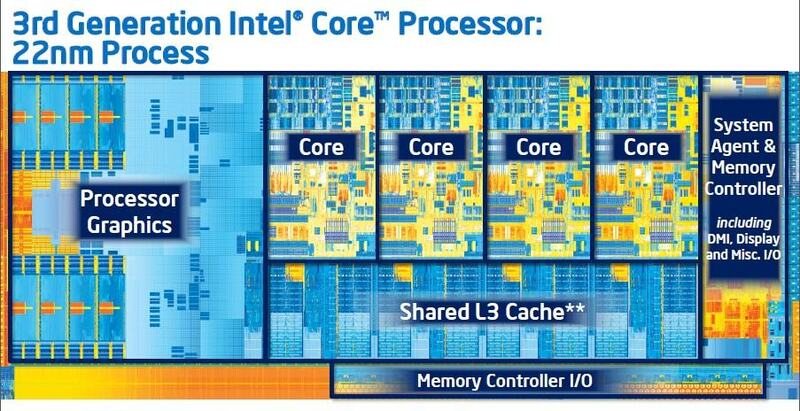 Like Ivy Bridge's turbo capable cores, the GPU has a dynamically scaling core frequency as well. The graphics processor tops out at 1350MHz which is handy for extra needed for today's games and apps. The HD 4000 supports up to 3 displays this time around which is very good for office productivity but not ideal for gaming. You'll need a couple good graphics cards for that. Now, the real question is what does this all do for you? As you can see, these are the primary features which the HD 4000 GPU supports. InTru 3D, HD Graphics, Clear Video HD, Insider and Wireless Display are hardwired to support your favorite media content whether 2D or 3D as well. We're talking about an impressive media viewing experience even over a Wi-Fi connection on desktop and mobile laptop processors. And, if you didn't know by now, Intel Quick Sync is optimized to work extremely well with software like Media Espresso 6.0/6.5 and ArcSoft to help transcode your favorite media in seconds rather than minutes. Chipset block diagrams are about the easiest way to compare Z77 and Z68 chipset changes that support Ivy Bridge. 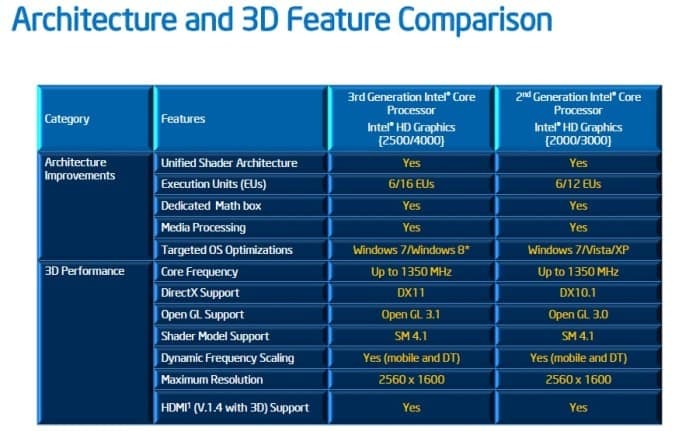 Remember, a lot of features are CPU integrated now so many of the features are similar and the diagrams reflect that. The motherboard chipset makes sure the CPU and peripherals communicate properly and efficiently. The big winner feature adopted by all Intel chipset ODMs is Lucid Logix MVP. The Lucid controller allows users to access their CPU's integrated graphics features in the previous section. However, it also allows the system to utilize the IGP and discreet graphics card's performance simultaneously which adds frames. This can come in very handy if your graphics card needs that extra support till you upgrade. Integrating USB 3.0 removes the need for third party controllers. Up to four ports are supported. However, if the platform features more, third party controllers have to be used to add them. The same goes for SATA3 ports which max out at six. A single x16 PCIE 3.0 lane is split in two 2 by 8x when running dual graphics. The chipset even supports Thunderbolt devices, originally known as Intel LightPeak. Z77 supports just about every form of UEFI BIOS that any ODM can create.